UCSC graduate student Grace Barcheck looks down on the bright Ross Ice Shelf en route to the Whillans Ice Stream. 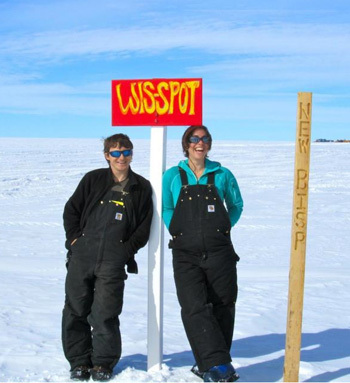 Graduate students Alex Michaud (MSU) and Marci Beitch (UCSC) pose at the test site on the McMurdo Ice Shelf, where the drilling and science teams tested their hot water drill and scientific instruments before deploying them at subglacial Lake Whillans. A team of scientists including faculty, graduate students, and technicians from UC Santa Cruz is in Antarctica on an expedition to explore Lake Whillans, which lies under a half-mile of ice. 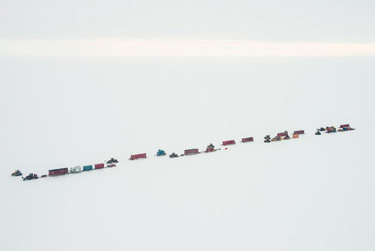 The team has just completed an arduous journey to haul their equipment 600 miles across the Antarctic ice from McMurdo Station, the U.S. Antarctic research center, to the drilling site on the Whillans Ice Stream. The project, called WISSARD (Whillans Ice Stream Subglacial Access Research Drilling), will investigate one of the last unexplored aquatic environments on Earth. The team includes researchers from eight U.S. universities and two collaborating international institutions. Researchers will use specialized tools to cleanly sample subglacial lake water and sediments, survey the lake floor with video, and characterize biological, chemical and physical properties of the lake and its surroundings. Slawek Tulaczyk, professor of Earth and planetary sciences at UCSC, leads the project's glaciology team. Subglacial Lake Whillans provides a unique window into the waterworks of the ice sheet. Studies by Tulaczyk and others have shown that subglacial water acts as a lubricant, enabling faster movement of glaciers and ice streams. "Many Antarctic subglacial lakes, including Lake Whillans, experience floods during which hundreds of billions of gallons of water drain into, or out of, a single lake basin," Tulaczyk said. "Since subglacial water is the ultimate lubricant for ice motion, these floods may cause large parts of the ice sheet to move faster towards the ocean." It has been difficult to investigate Antarctic water drainage systems because they are hidden under thick ice. In addition to Tulaczyk, UCSC participants in the WISSARD project include Andrew Fisher and Susan Schwartz, both professors of Earth and planetary sciences; graduate students Grace Barcheck, Marci Beitch, and Ken Mankoff; and instrumentation engineers Dan Sampson and Robin Bolsey. Fisher, who recently returned from working on the project in Antarctica, said it is unlike any project he has worked on before. "It's sort of a cross between an oceanographic expedition, space mission, and general Earth science and biological field work, with a dash of summer camp thrown in for flavor," he said. "This was my first season working in Antarctica, and it left me impressed with the whole operation. What is being attempted has not been done before, and it will open up a whole realm of research questions and opportunities." The samples and data collected by the WISSARD project will be used to address a range of questions about subglacial biology, climate history, and the behavior of ice sheets. Specific questions include the following: Does microbial life exist in a subglacial lake environment and, if it does, what is the metabolic and phylogenetic diversity of subglacial life? Did the Antarctic ice sheet shrink in the recent past and expose the study area? Can subglacial lakes influence rapid retreat of the Antarctic ice sheet in the future? The WISSARD microbiology group, led by John Priscu of Montana State University, will use sophisticated chemical and genetic analyses to see if microbial life can survive beneath the Antarctic ice sheet. Subglacial Lake Whillans is part of a vast Antarctic subglacial aquatic system. Discovery of life in this isolated environment will help scientists understand the limits of life on Earth and inform the search for life on other planets. "This is one of the last unexplored frontiers on our planet. Understanding the functional role of subglacial organisms will provide us with new information on the role of Antarctic in the Earth system," Priscu said. Geologic investigations of WISSARD samples, led by Ross Powell of Northern Illinois University, aim to verify if the West Antarctic ice sheet retreated past Lake Whillans during previous periods of warm climate. Since the lake basin itself is actually located more than 2,000 feet below sea level, WISSARD geologists will be looking for evidence of marine microfossils and isotopic tracers of seawater that may be still present in sediment cores. Powell said sediments on the lake floor not only act as the main nutrient source for subglacial microbial communities, but are also a "library" that holds records of past changes in the lake and perhaps even older actions of the West Antarctic Ice Sheet. To enable clean access into subglacial Lake Whillans, a team of engineers and technicians, directed by Frank Rack of the University of Nebraska, Lincoln, spent nearly two years building a new hot-water drill capable of melting through 2,500 feet of ice in just a few days. It can blast a pressurized hot-water jet at up to fifty gallons a minute. The drill is connected to a truck-size water filter that will remove cells and particles larger than 8 millionths of an inch and kill any remaining cells with a powerful dose of germicidal UV radiation. All drill parts and scientific tools entering the borehole are pre-cleaned with hydrogen peroxide and, finally, go through a microbe-killing UV chamber. Laboratory tests in the U.S. in concert with Antarctic field tests have shown that this system can reduce the number of viable cells by many orders of magnitude. Such cleaning will prevent contamination of the lake and protect the integrity of samples obtained from the subglacial environment. The WISSARD drill, along with fuel, field laboratories, workshops, computerized control centers, and scientific instrumentation, as well as a deck and crane to support field operations, arrived at the lake on January 12. Hundreds of thousands of pounds of cargo were brought to the site on giant sleds dragged for two weeks behind powerful tractors. The traverse route paralleled the first half of the famous trek that Scott's expedition took to the South Pole in 1911. WISSARD drillers and scientists are now waiting for favorable weather to enable them to rejoin their equipment at the drill site. 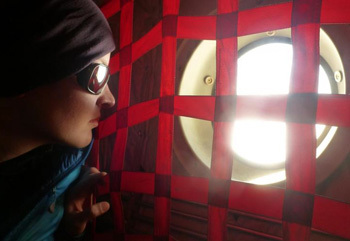 They will fly out of McMurdo Station on ski-equipped airplanes operated for Antarctic research support by the U.S. Air National Guard and Kenn Borek Air. On site, and at the station, the WISSARD team is supported by many dedicated individuals working as part of the Antarctic Support Contractor, managed by Lockheed-Martin. The core funding for the WISSARD project comes from the National Science Foundation Office of Polar Programs, with additional funds for instrument development provided by the NASA Cryospheric Sciences Program, the National Oceanic and Atmospheric Administration, and the Gordon and Betty Moore Foundation.